The Multi Annual Financial Framework (MFF) post 2020 is a unique opportunity for the EU to demonstrate coherence with its long-term energy and climate objectives and show commitment to deliver tangible benefits to European citizens. Our business community sees the MFF as a necessary trigger for outlining the much-needed long term political direction for mobilizing private investments towards a decarbonized European economy. Public EU funds alone are not sufficient to finance this energy transition. According to a recent report of the European Commission, the EU budget contribution to mitigation finance covers as little as 5-7% of the total resource required1. But the EU budget has an important leveraging role to play in attracting private investments necessary to fill the gap. The investments in clean technologies, and in particular in cost-efficient energy efficiency projects, will only get unlocked if the EU provides long term certainty to the private sector. Our position paper A climate-proof budget to leverage the necessary investments to deliver the Paris Agreement outlines in greater detail the views of a cross sectoral alliance of businesses on the current discussion concerning the overall MFF proposal and the related sectoral funding instruments. It calls for a full application of the Energy Efficiency First principle, increased climate mainstreaming and improved climate proofing. 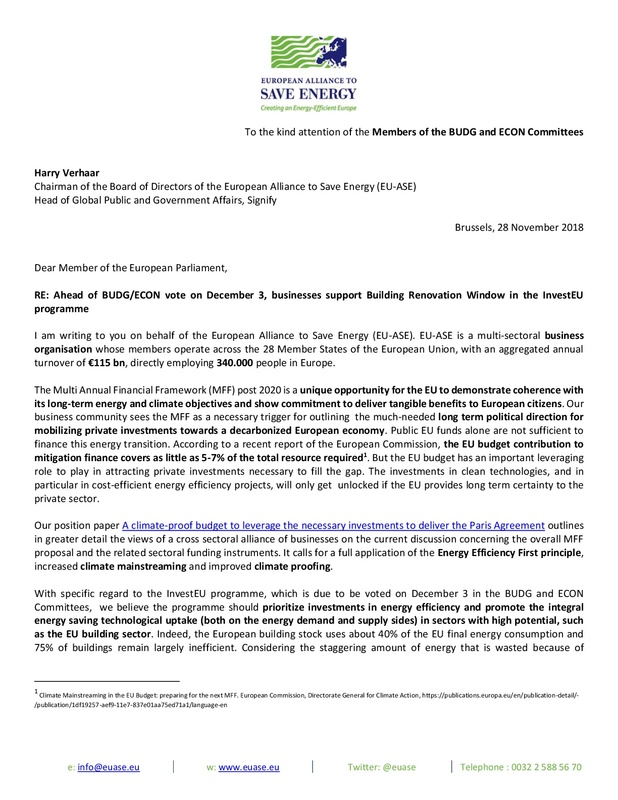 With specific regard to the InvestEU programme, which is due to be voted on December 3 in the BUDG and ECON Committees, we believe the programme should prioritize investments in energy efficiency and promote the integral energy saving technological uptake (both on the energy demand and supply sides) in sectors with high potential, such as the EU building sector. Indeed, the European building stock uses about 40% of the EU final energy consumption and 75% of buildings remain largely inefficient. Considering the staggering amount of energy that is wasted because of inefficiency in power and heat production, delivery and consumption in this sector, we should put all our effort to minimise this waste, which can be avoided. Our homes are responsible for about 36% of CO2 emissions in the EU. Such emissions must be cut by at least 90% to reach net zero by 2050 and limit the devastating impact of climate change on people, communities, economies and ecosystems around the world. In addition, we should not underestimate that, beyond energy and cost savings, the renovation of buildings, being building management systems or staged deep renovation, also brings along non-energy related benefits such as the creation of local jobs, thermal comfort, better living conditions, healthier populations and it is likely to eventually pave the way for the electric vehicle revolution2. Hence, the question of feasibility: one of the key barriers in the much needed renovation of European residential buildings is leveraging finance from the private sector. The ITRE Committee voted in favour of the creation of a building renovation window which could address this barrier and could help tackle the EU renovation challenge by stimulating private investments. Dedicated funds for building renovations will provide EU guarantees for the development of innovative financing schemes such as energy performance contracting, pre-financing with on-bill or on-tax repayment, green bonds and green mortgages that will help to finance large amounts of small projects stemming from the EPBD long-term renovation strategies and will help to increase the renovation rate across the continent. Dear Member, ahead of the vote on December 3, we urge you to support the ITRE proposal to create a building renovation window because investing in the renovation of our homes simply makes economic sense and speaks to the hearts and minds of people. We remain at your disposition for further discussion on this strategic topic. Rocky Mountains Institute Report on EVs deployment, which predict a 3,000 Twh increase in electricity demand by 2040 if the world switches to electric vehicles as fast as their fastest scenario. To ensure that the power grid has sufficient capacity to deal with it, the researchers advocate accelerated action from political leaders and to step up the renovation of buildings to improve their energy According to the researchers, increasing the current global building retrofit rate from approximately 1% per year to just over 5% per year, could accommodate baseline adoption of 550 million electric vehicles on the road through 2040 without increasing generation capacity dramatically.